DUG Insight User ManualFrequently Asked QuestionsFrequently Asked Questions Sessions and ProjectsHow should I backup my project? manual backup using Data Manager. We recommend using both methods to backup your project as they are both unique in the way they perform the backup. The automatic backup creates a copy of the .dugprj project database file in a .backup folder in your project directory. However, horizons, volumes, TIFFs, etc, are NOT contained within the database. The database file only contains references to the individual objects and not the actual physical copy. 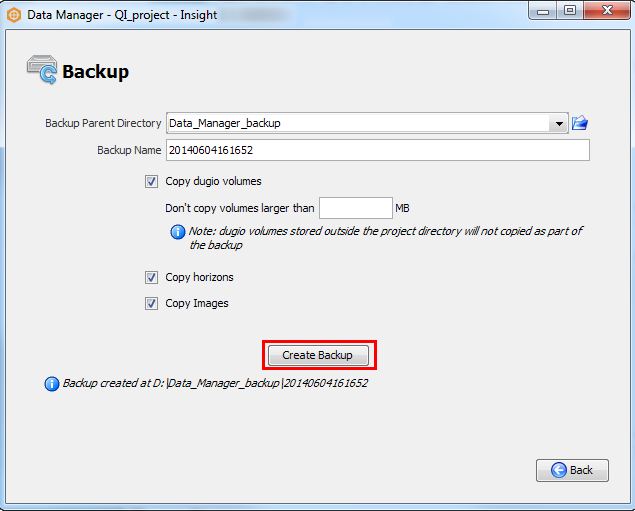 To physically backup the project directory, you have to use the Backup feature in Data Manager. Hence, it is recommended that you regularly create full, physical backups of your Insight project as well. Do NOT copy the project using normal tools (i.e. copy/paste), as Insight might modify the files during copy, or other users might be logged in and modifying the project while the backup is done, resulting in a corrupt copy of the project database. The only safe ways to make backups are the two mentioned in this lesson. Note: The automatic backups configured in the project settings should not be confused with session autosaves. Autosaves record the session (not the project), and occur once every 5 minutes. Only one autosave is available per session as each new autosave overwrites the previous one. As soon as the session is manually saved on closing, the last autosave is discarded (see Autosaves in Project vs Session). In contrast, the Automatic Backup creates and keeps a number of copies of the project database (as defined by the user) at a user-defined frequency. When creating or configuring a project, you can enable automatic backups by selecting Perform automatic backups under the Backup Settings section. Specify the number of hours that must pass for Insight to create a new backup and the number of copies you want the system to keep before deleting older copies. 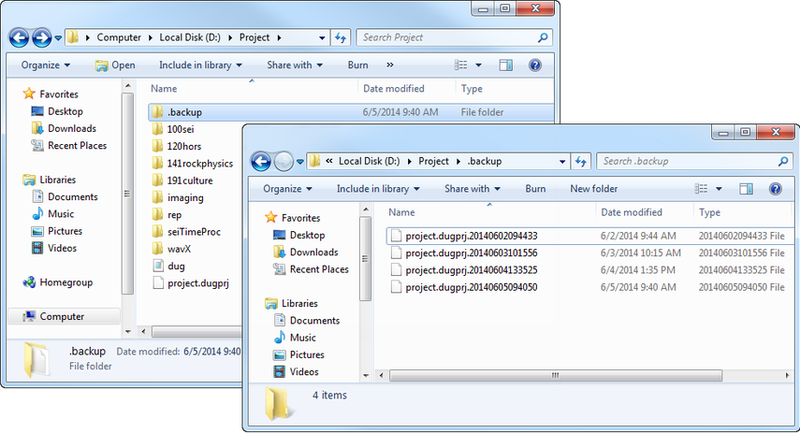 The automatic backup creates a copy of the .dugprj project database file in a .backup folder in your project directory. Before backing up, Insight will check if there are other users logged in (an "integrity check"), and locks the project from being modified while it backs up the project database to the backup folder. At every start-up of the project, Insight will automatically check if the required hours have passed to create a backup. It it has, then it will create one. Note: If your database is corrupted, Insight will disable access to the database until the project is fixed. This is to prevent any further file corruption, and prevent Insight from generating backups of the corrupted project. If your database is corrupted, please consult our support team at support@dugeo.com. You might be required to send diagnostic logs of your project session to help us understand why it is happening (see Viewing and Sending Diagnostic Logs). 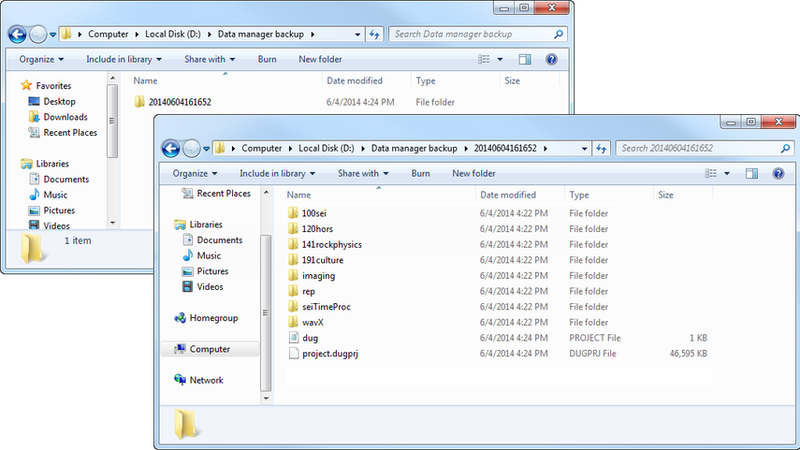 The following image shows an example of the backup folder and backup project database files. Note: The backup folder might be a "hidden" folder. If you do not see the backup folder in your project directory, you might have to enable viewing of hidden files from the Folder Options of your machine's Control Panel (see Show Hidden Files). The Backup feature in Data Manager creates a physical copy of the project directory into a Backup Parent Directory of your choice. By default, Data Manager sets the Backup Name as the current date and time for convenience when restoring using the Restore feature (see Restore a Project Database). 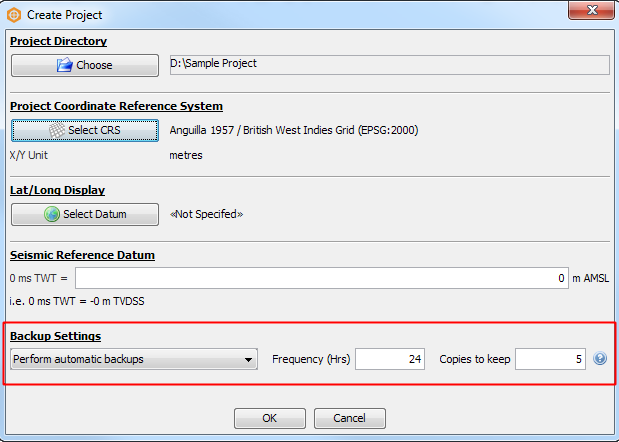 Select the Copy dugio volumes/horizons/images check boxes to backup the physical copies of the objects. As volumes are often large files, you can choose to ignore volumes over a certain size by specifying the maximum size in the Don't copy volumes larger than X MB field. If you do not select the check boxes, the backup will only copy references to the objects. Any volumes external to the project will not be included when you create a backup. To create a copy of the database with external volumes, see Clone a Project Database. Note: Backups of the project database file generated by the automatic backups are NOT included in the Data Manager backup directory. Prev: How do I load sample data? Next: Where is my user home directory?